Well, I think November and December may have gotten their signals crossed. It seems our weather has turned to the better for some and not so much for others. With highs near the 50’s we are certainly not building much ice. In fact, I had to pull my spear shacks on Lake Sakakawea this week and wait for colder weather. I will be getting those back out as soon as I can to offer Guided Dark House Spearing Trips. Contact me at mikepelusooutdoors@gmail.com to reserve your spot! I was able to venture out and chase some perch again this week on some out of the way sloughs. The smaller sloughs are holding up ok as far as the ice is concerned. The larger bodies of water like Lake Sakakawea and Lake Oahe, not so much. Be careful please, especially down on Oahe. Moving water and high temps are not a great combo. I would anticipate and few areas opening back up down that way. If I hear of anything I’ll be sure to report it for you guys. So what can a person expect right now? Just like in the summer months, nice steady weather conditions are usually pretty good for the bite. Again, not so great on the ice conditions, but the bite seems to be doing really well! Judging by all the social media I am seeing folks are doing well! 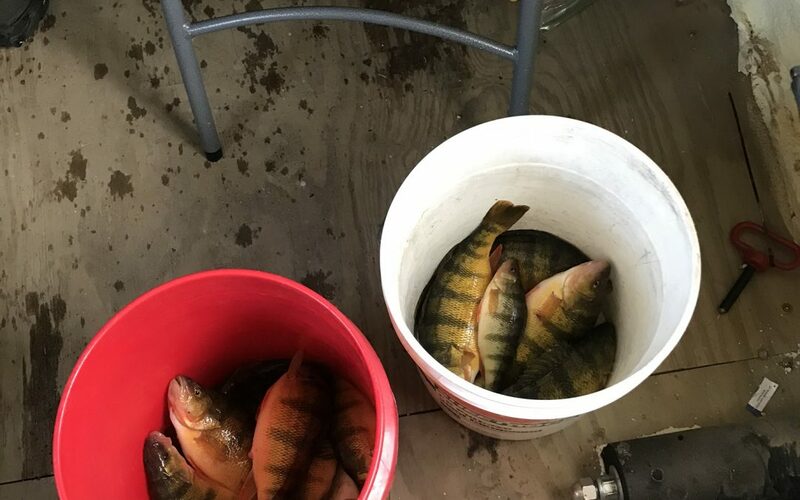 Both walleyes and perch on pretty much every body of water that is safe to fish, is doing pretty good! Devils lake to Lake Audubon and numerous Prairie Potholes are all producing good activity. Another thing to remember is the Missouri River from the Tailrace down past Bismarck is still doing pretty good! The numbers of fish may not be around, but the quality is! Until next time be safe on the ice and enjoy this warm up! I’m guessing we are going to pay for this warm December. Let’s just hope it’s not in April. Site Designed and Managed by Flyway Media.